Brendan Leonard is a writer, and most of his work centers on adventure, travel and human experiences with both of those. TAHOE CITY, Calif. — Critically acclaimed Semi-Rad.com author Brendan Leonard will present stories from his newest book, Sixty Meters to Anywhere. The presentation will take place at 7 p.m. Friday, Dec. 9, at the Tahoe Art Haus & Cinema, located at 475 North Lake Blvd, Tahoe City. Leonard, a contributing editor at Climbing Magazine, Adventure Journal and The Dirtbag Diaries, is a refreshing take on the adrenaline-filled extreme sports world. Denver-based Leonard is most known for the funny and inspirational adventure essays he’s published on Semi-Rad.com since 2011, but his path to the mountains started in a much darker place. When Brendan Leonard moved to the West at age 23, he was a mess. He had a tenuous grip on sobriety, only six months after his last drink had landed him in yet another jail cell. It was the final mistake in a long list that included multiple arrests, wrecked cars, broken bones, fistfights, and ruined relationships. In Montana, he took his first steps into the Rocky Mountains, unwittingly beginning a decade-long obsession with climbing and a journey that would take him all over the West and Europe. 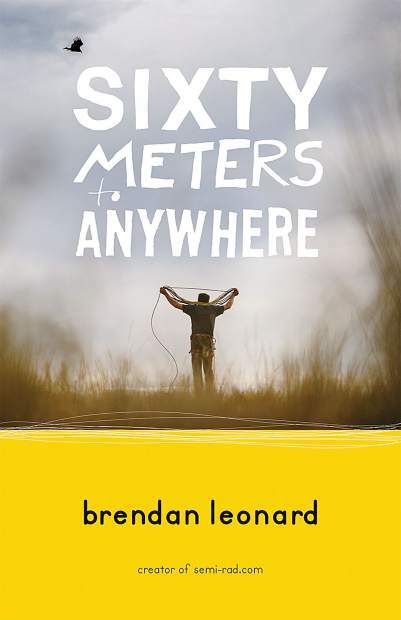 Written with unflinching honesty and vulnerability, Sixty Meters to Anywhere is the memoir of a barstool storyteller who left the bar and found adventure, redemption, and a life that almost never happened. “I think it’s a book about taking control of your own story. We all have certain narratives we tell ourselves, or certain things we believe we are, for better or worse,” he says, “At one point, I was a loser, an addict, and a screw-up, and I didn’t want to be those things anymore. Tickets for the show are $11 pre-show ($14 night-of) and available at http://www.brownpapertickets.com/event/2711794. Online ticket sales end at 4 p.m. on the afternoon of the event. Leonard will be on-hand both before and after the show to sign copies of his book, which will be available to purchase. This article was provided by Alpenglow Sports, based in Tahoe City. Visit alpenglowsports.com to learn more.